"To dance is to be out of yourself. Larger, more beautiful, more powerful. This is power, it is glory on earth and it is yours for the taking". Dance has a long history in India. A large amount of material related to dance, dating from as early as the 2nd century BCE up to the 21st century CE, is available. 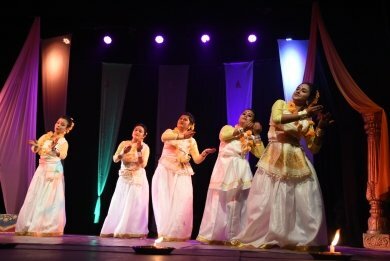 India is so diverse that at present it has eight classical dance forms recognised by the Sangeet Natak Akademi and the Ministry of Culture, Govt of India; among them Sattriya represents Assam. 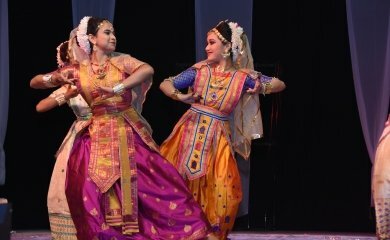 'Saptaswa...the rays of performing art,' a socio cultural organisation of Tezpur, Assam, is also nurturing the classical dance forms of India in the form of a national dance festival since 2011. Saptaswa celebrated the 8th edition of Nrityakalpa on 16th and 17th March 2019 in the heritage Baan Theatre, Tezpur. The first day's program was inaugurated by chief guest Gopal Krishna Goswami, Principal, Aviyatri Sangeet Mahavidyalaya. As per tradition, the program began with a Gayan Bayan performed by the students of Saptaswa. The performers Megh Mallika Bora, Swati Bayan, Samriti Bora, Namrata Gogoi, Mrigashree Baruah, Mayurakshi Das, Niharika Nath, were interestingly all female. The next item was a Swahid Sradhanjali performed by junior students of Saptaswa dedicated to the brave jawans of our country who protect us at the cost of their lives. This item was choreographed by Prerona Baishya and Irani Mahanta. Sattriya was presented by prominent Sattriya dancer Ranjumani Saikia, disciple of the legendary maestro Rasheswar Saikia Barbayan. She started her preliminary training in Sattriya at age 5 and has received many awards. Her first item was a Krishna Vandana on four slokas set to Thukani taal, Chutkala taal and Ek taal. This was followed by a Borgeet abhinaya based on "Mai hero Gokulo chando..." of Sri Madhavdeva, followed by a pure lasya recital, Melan nach of Chali nach set to ek taal. Odissi was presented by Vinod Kevin Bachchan, a senior disciple of Guru Ranjana Gauhar, from West Indies. Bachchan presented his first item on lord Visweshwara. The poet says, "If you pray to him with love, He, the compassionate one, will surely cut asunder the cycle of birth and death for you." This was based on raag Asavari, taal Khemta, choreographed by Ranjana Gauhar and music composed by Saroj Mohanty. This was followed by Pallavi considered the most lyrical presentation in Odissi. Kathak was presented by Aligunjan Kalita Mudiar, a disciple of Guru Surendra Saikia of Lucknow Gharana for twenty five years in guru-sishya parampara as a "ganda-bandh" sishya. Aligunjan started her program with a Ganesh Stuti followed by a pure dance in teentaal - presenting upaj, thaat, uthan, amad, tihai in vilambit laya followed by paranjori amad, tukra, paran and tihai in madhya laya. Then she presented Ras Ranjan, the abhinaya part of Kathak showing the two different rasas, karuna and shringara. She concluded with some tukras, parmelu, gat and paran in drut laya. It was a fantastic performance. The final program of day one was presented by Dr. Pratibha Sharma, backbone of the festival. She started with a Krishna Vandana in Kaliyadaman story followed by Sutradhari Nach and an abhinaya piece on Kunti Katha based on the story of Mahabharata, choreographed by Guru Jatin Goswami with music by Dhrubajyoti Baruah. Second day's program was inaugurated by Dr. Purneswar Nath, Rt. Professor of Darrang College. 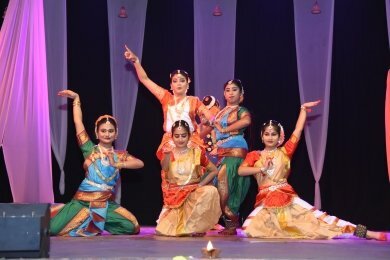 The program began with a beautiful traditional dance form of India, Devadasi. In every Indian classical dance form, the tradition of Devadasi is reflected. In the scriptures and books of Srimanta Sankaradeva, he mentioned that he has seen this special dance form in the temple of Sri Jagannatha. In Assam, the culture of Devadasi was found in Parihareswar temple, Dubi, which is reflected by Bhaskaravarman in his metal scripts and as per that the tradition of Devadasi is at least 1420 years old. In the Ahom dynasty this traditional dance form was also practised in the Baneswar temple of Biswanath and Negheriting temple of Golaghat. For practising the dance, the king created some ranks like Gayan Baruah, Bayan Baruah, Sattriya Baruah etc. Now, in this modern era there is no culture of Devadasi but it has a bright history. 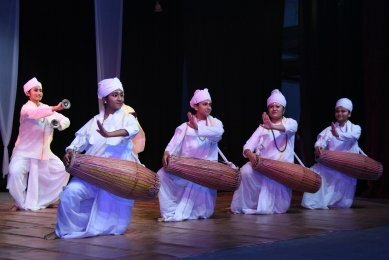 To reflect this forgotten history, Saptaswa presented a Devadasi performance by Meghmallika Bora, Swati Bayan, Mayurakhi Das, Prerana Baishya, Niharika Nath and Irani Mahanta. The accompanying musicians were Ranjan Mahanta (khol), Hirak Nath (flute), Sonit Mahanta (violin) and Mrigashri Baruah (taal). The second item was a Mati Akhora. Mati Akhora is the base of Sattriya and is the first step towards the grammatical correction of Sattriya dance form. With this the famous colourful Lobonuchuri Nritya was also presented. In the Jumura created by Sri Madhavdeva he introduced this fantastic dance of lord Krishna depicting his childhood days. This eye catching item was performed by the youngest learners of Saptaswa. 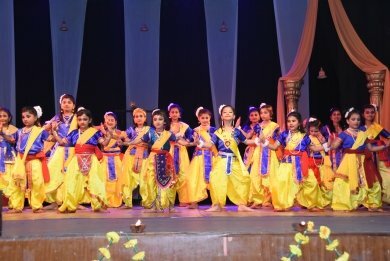 Bharatnatyam was performed by the students of Jyoti Kalakendra Sangeet Mahavidyalaya, Tezpur - Debarathi Saha, Navaparna Dhar, Gayatri De, Sanchita Das, Rituparna Gupta and Amisha Kundu. 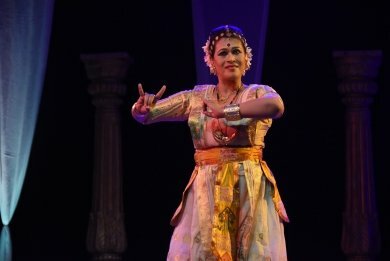 The item was directed by Sonali Sarkar, a renowned Bharatanatyam artiste of Assam. The concluding item of the second day was a Sattriya dance drama based on the famous Sonit Kuwari, the first drama of Rupkonwar Jyoti Prasad Agarwala, depicting the story of Usha and Aniruddha. It was portrayed in a very smooth manner. This was directed by Dr. Pratibha Sharma assisted by Irani Mahanta and Prerona Baishya. The artists were Nayammani, Swati Bayan, Jujutsu Bhuyan, Nayanmoni Hazarika, Prerona Basihna, Meghamallika Bora, Imon Nath, Mrigashree Baruah, Namrata Gogoi, Sampriti Bora, Mayurakhi Das, Niharika Nath, Diganta Deka, and Hrishikesh Saikia. Musicians were Ranjan Bora, Kusha Mahanta, Tarun Kalita. Voice was by renowned artist Pankaj Bordoloi and Mridul Kumar Sarma, music arrangement by Gautam Medhi, stage direction by Prafulla Chandra Bora, with Bipul Nath on the lights.